(b. 1960, St.Petersburg, Russia), Conductor and Artistic Director of the ORTHODOX SINGERS vocal ensemble. Graduated from the Estonian Musical Academy (1987). In 1989 established a chamber choir specializing in Orthodox sacred music, which, in 2003, adopted the name “Orthodox Singers.” Specialist in the area of early Slavic church singing and medieval music. 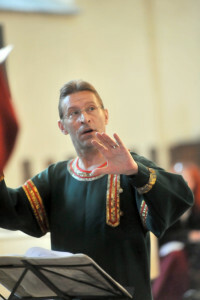 Known as a promoter of Orthodox sacred music in Estonia and northern European countries. Composer of a collection entitled All-Night Vigil (1999), based on original chants of the Valaam Monastery, which draws upon Orthodox music from different historical periods and styles. While expressing a preference for early music, V. Petrov at the same time is a marvelous interpreter of new music, including the music of Orthodox composers of the 20th and 21st centuries—among them Arvo Part, John Tavener, and Valery Kalistratov. His repertoire in the area of Orthodox sacred music has practically no stylistic or chronological boundaries. A conductor of the “authoritarian type,” he strives for maximum thoroughness of interpretation, worked through to the tiniest details. V.Petrov’s mastery is characterized by a virtuoso conducting technique, subject to a profound understanding of a work’s spiritual essence and the composer’s creative plan. He is capable of capturing and communicating to the ensemble the essential features of any style. His manner of conducting is characterized by economy of gesture, emotional restraint, a wonderful sense of form, coupled with a spiritual concentration. At the same time, he possesses an acute sense of dramatic gesture. Creator of “mixed-media” projects that synthesize musical and theatrical elements: the musical mystery-play Passion According to Andrew (2000) to the music of Arvo Part, which artistically portrays the secret night-time liturgy of the early Christians in the Roman catacombs, and the musical drama for choir Quo vadis?, where music of the 20th and 21st centuries is heard alongside early chants. V.Petrov regularly tours with his ensemble in Europe and the USA. Over the years he has shaped the ORTHODOX SINGERS into an ensemble marked by a high professionalism. Its unique repertoire and performance manner have garnered widespread acclaim. The ORTHODOX SINGERS have received awards at numerous international competitions and have taken part in some of the leading European musical festivals. As one recent Estonian music critic noted: “To sing like this ensemble is impossible without belonging to the Orthodox world” (Ivalo Randalu, Sirp, 2 July, 2004). And yet another characteristic noted by critics and listeners: the unique piano that Valery Petrov is able to elicit from his ensemble. “At times it seemed that to sing so softly is next to impossible; the sound was like the wafting of a gentle breeze, through which one would be able to hear the fluttering of a maple leaf on a summer day” (Ivalo Randalu, Sirp, 2 July, 2004). V.Petrov generously shares his mastery with young musicians, regularly holding master classes for conductors and singers in Estonia and in Sweden. He has also lectured at the Nottingham Trent University in Great Britain. In June of 2004, during the largest choral festival in Europe, EUROPA CANTAT, which took place in Tartu, Estonia, Valery Petrov directed a Russian music seminar-practicum, the concluding concert of which was acclaimed as the finest one of the Tartu Musical Week. With the ORTHODOX SINGERS V.Petrov has recorded three cassettes and six CDs. In 2003 Valery Petrov received an award from the Estonian Cultural Foundation for outstanding achievements in the area of culture, and in 2004—the Order of the White Star of the Estonian Republic. In May 2011 Valery Petrov recieved the title of Honorary Citizen of Tallinn City.